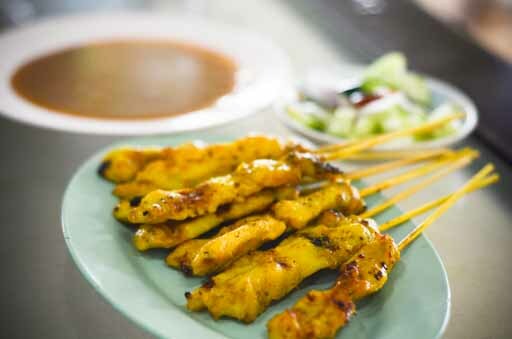 This recipe is how satay is frequently made in Thailand. I omit sweet and condensed milk when I make satay. What is in the sweet condensed milk is milk, fat and sugar. I think that sugar and coconut milk already made up for the sugar and fat of the condensed milk. Soak bamboo skewers for at least half an hour to keep the ends from burning when being grilled. 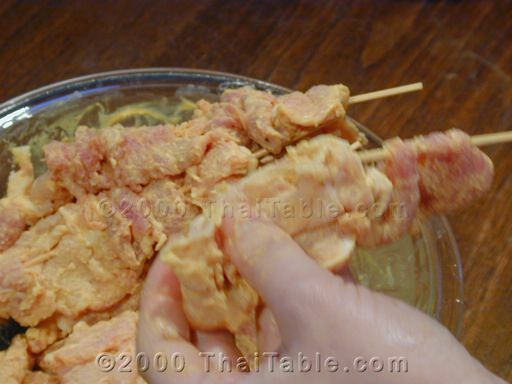 Slice the pork into thin strips (about 1/4 of an inch thick) that will fit onto the skewers. 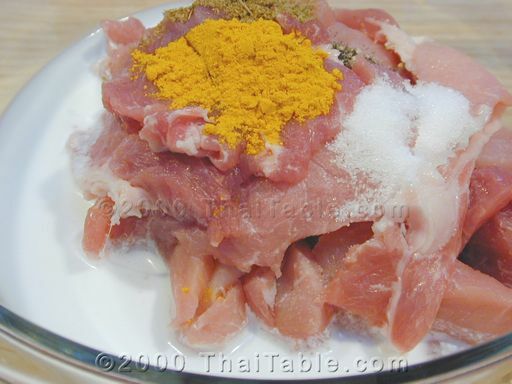 Add cumin, black pepper, turmeric, sugar, sweet condensed milk and coconut milk to the sliced pork. If you choose to add sweet and condensed milk, add it to the mixture. 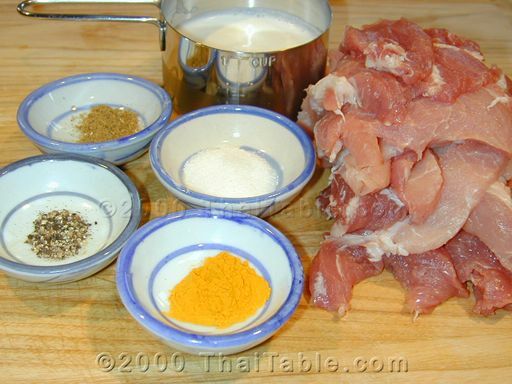 Mix well to coat the pork with the marinade. Marinate for half an hour (during the same time you soak the skewers) or overnight. For shorter marinate time, I massage all the seasonings into the sliced pork for a couple minutes. Thread the pork onto the bamboo skewers. When you get the skewers at a restaurant, the meat is normally stretched out flat. While this looks nice and makes economical sense for restaurants, I find that stuffing the skewers gives me a moister, tastier satay. 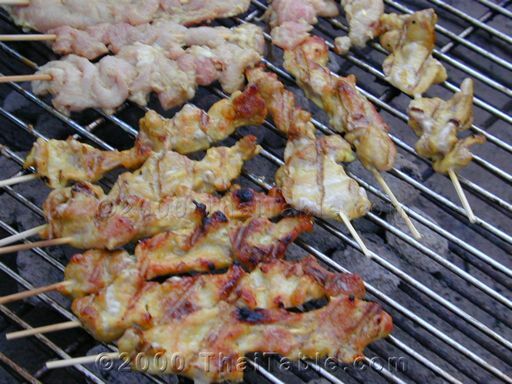 In Thailand, the satay is grilled on a rectangular, narrow charcoal grill that fits just one row of satay. The charcoal has been burning for a while. It is hot, but not flaming. 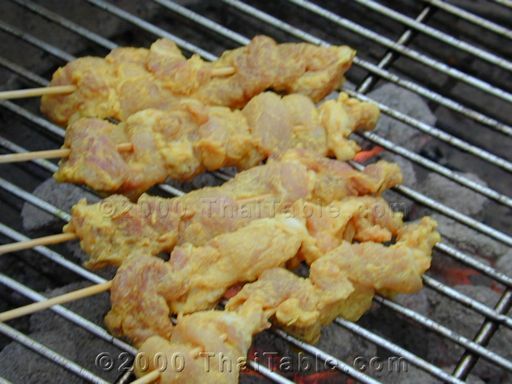 There should be ashes covering the charcoal so that the satay can be cooked evenly without burning. 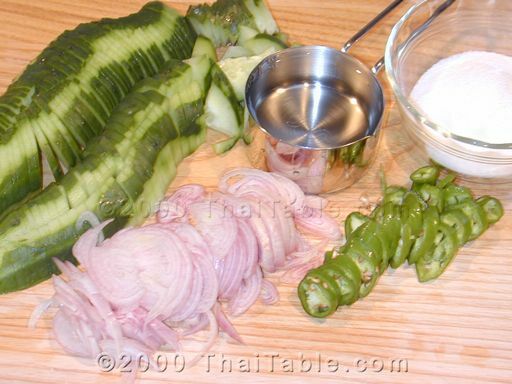 Grill and serve with peanut sauce and cucumber in vinegar. 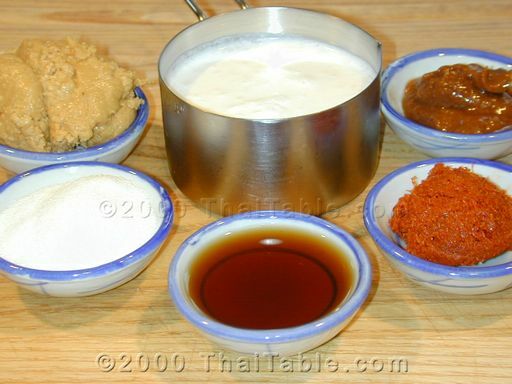 In Thailand, people use peanuts ground up in a mortar instead of peanut butter and the sauce is granular with just a little creaminess. However, I use peanut butter because peanut butter is essentially finely ground peanuts and more convenient and common in American kitchens. The peanut butter I prefer is chunky natural, freshly ground (instead of the brands that have sugar or vegetable oil added). Smooth peanut butter will do too, if that is what you have in your kitchen. Add the coconut milk to a cold sauce pan and start to heat it up at medium heat. 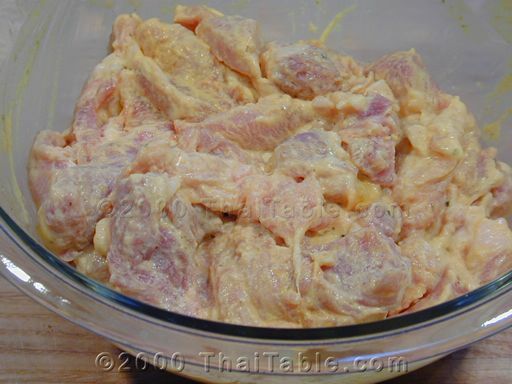 As it is heating, stir in the curry paste and break the paste into small pieces. Mix well. 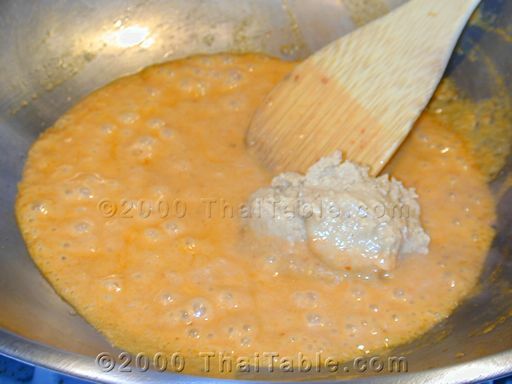 When you see red oil simmering to the top, add the peanut butter and the rest of ingredients. Stir and taste. You should be able to taste the fish sauce, sugar and tamarind flavors. If it becomes too thick, add a few teaspoons of water to thin the paste. Serve with satay and cucumber salad. Place the sauce on a flat plate for easy dip, saucer dish is the best. In Thailand, we use long red peppers that are mild, but I have a hard time finding ones that come close in flavor to it here. You can cut back on the sugar if you like. Place all ingredients in a serving bowl. Chill and serve.